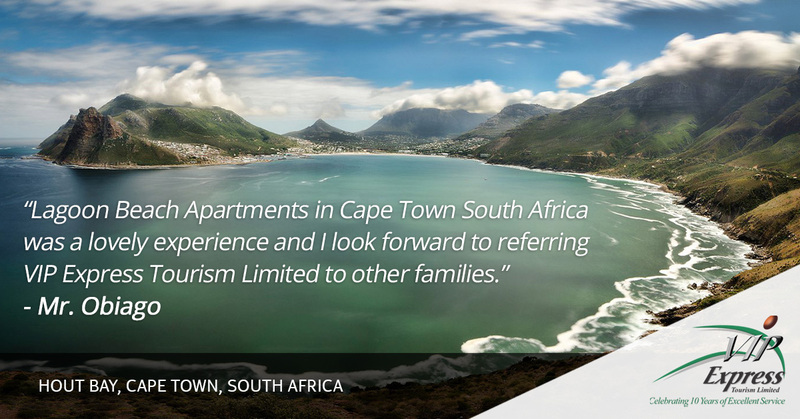 Lagoon Beach Apartment in Cape Town South Africa was a lovely experience and I look forward to referring VIP Express Tourism to other families. We also look forward to your other apartments, in other cities around the world. We hope to get similar experiences. Johannes and Chris were exceptional in their customer service; they ensured that we didn’t lack anything and made life east for us, they were professional and pleasant. Check-in speed and efficiency, accommodation, cleanliness, tours, housekeeping staff and management were all excellent. Mr Obiago C.P. from Lagos.